Have you ever had the experience of going to a site and patiently waiting forever for it to load? Probably not, because no one waits forever for a site to load. We just close the browser tab and move on. When it comes to getting the user’s attention, we only have a very brief window of opportunity. According to Ilya Grigorik, on his “Speed, Performance, and Human Perception” keynote, you only have one second. After that first second, a mental context switch occurs. In the user’s mind, it has been so long that they start to think about other things. And after about 10 seconds, the user is already bored and will probably close their browser tab and get on with their day. What I will cover in this guide is a process for optimizing your website’s performance. I’m going to use my own site as an example. If you haven’t done the things discussed in this guide, you will get guaranteed website speed improvements after performing the steps that I will be discussing. The first thing to do is to test the current performance of the site. 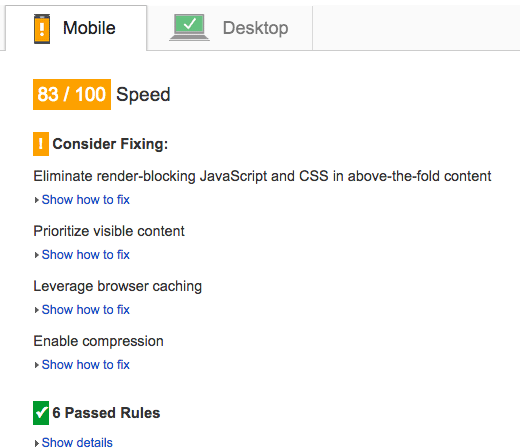 This will help us see issues related to web performance, as well as help us prioritize our efforts. 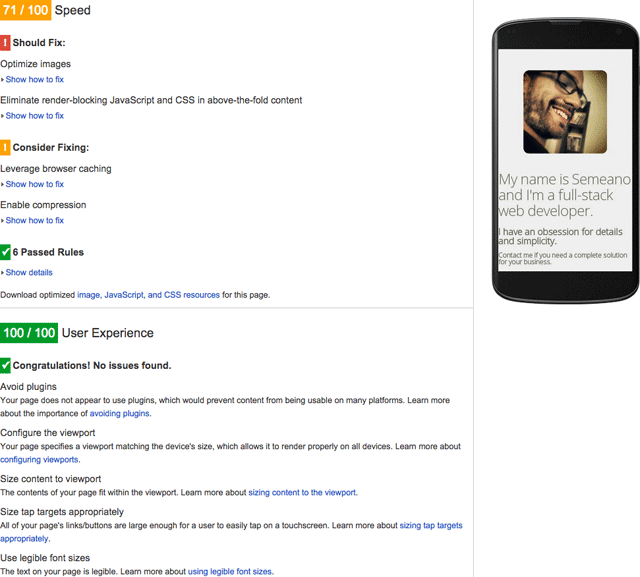 One excellent tool for benchmarking front-end performance is Google’s performance analysis tool, PageSpeed Insights. It will check your site and give you a score based against a set of performance guidelines and best practices. There are two general approaches to improving website performance with the use of developer tools. The first approach is straightforward: Grab all your files and use the online tools to do whatever it needs to do (lint, minify, concatenate, etc.). What if you have 50 files to minify? Or 200? And what if you change your code? Are you going to repeat that task over and over? That’s why I’ll cover the second approach, because it’s more flexible and scalable. However, it’s a more complicated approach, especially at the start. The first thing to do is to set up a project working environment. All I did was grab all the files from my site and move them to a folder called src in my computer. By the way, you will need Node (and npm) installed to be able to use Gulp in the manner I’ll be describing. See How to Install Node.js. Then go to your project folder and install it in your development dependencies. After that, you’ll see a new folder that will automatically be created for you called node_modules. That’s where Gulp and all your other Node modules for the project will be stored. There’s just one more step to perform before running Gulp: We need to set up a configuration file so that Gulp knows what tasks to perform on our files. And that’s as easy as creating a file called gulpfile.js in your root folder with any text editor or source code editor. Now that we have Gulp ready to go, the next step is to create the Gulp tasks to do all the work for us. OK, let’s get some stuff done with Gulp! First task: Minifying our CSS and JS files. Minification is performed in order to get a very small file size, while still preserving all our style rules and JS functionality. In order to minify our files, we’ll need to install node modules that will help us with the task. Now that we have our required modules, we have to create the task for each one. We can actually do everything inside our default task, but I prefer to do a separate task for each type of file. This way, we’ll keep our code cleaner, easier to read and maintain, and, if we want, we can run the task for the CSS or the JS files separately. Let’s add our minify-css and gulp-uglify modules to the top of our gulpfile.js. All the processed files will go inside the dist folder after the tasks have been performed. Issuing the gulp command again in your terminal/command prompt will create the dist folder, with the css and js folders inside that will contain our minified files. Sending down the wire just a couple of files instead a bunch of them makes the whole process of loading a page much faster. So what we’re going to do next is merge all our CSS files into one .css file, and all our JS files into one .js file. And for that, we’ll use the modules gulp-concat-css and gulp-concat. We’re using different modules because gulp-concat-css is more appropriate for CSS files since it does the rebase of the URLs automatically. The reporter method is what will output the warnings on the terminal/command prompt. We’re using the default reporter, but you can change it to a different one. When we run PageSpeed Insights, it will check if the images that we’re using are larger than they need to be. We can strip all the metadata from the images, which will reduce the file size a small bit. To optimize images, we’ll be using gulp-imagemin for raster images (e.g. JPG, PNG, and GIF) and gulp-svgmin for SVG files respectively. That is happening because I’m using the same image for desktop and mobile. Everything was fine on the desktop tests, but on mobile, since I’m using the original image and resizing it, I’m wasting a lot of pixels. The solution for this is to have different image sizes for each media-query breakpoint. That way, if you need a 200x200px image, the browser will download only that size, saving bandwidth along the wire. Minifying our HTML files is also important, and here is where you’ll probably see the most savings in file size. To minify our HTML documents, we’ll use the gulp-minify-html. Also, in order to make the changes on the resources automatically, from the files in the src folder to the dist folder, we need to install gulp-useref. This task requires a small change in the HTML files (in this case there’s only one, the index.html). We need to add a special comment for the gulp-useref module referencing a block on resource files (html5reset-1.6.1.css and semeano.css) that will result in a single file (semeano.min.css) after the concatenation and minification. What that basically means is that before running the default task, Gulp needs to run all those tasks first. After these changes, we can see some improvement on the score. It seems like a small change (only 12%) but after the minification of our files we are sending 33% fewer KBs compared to before. That’s something! And it didn’t take a whole lot of time to achieve. Use of spritesheets. Instead of downloading a set of images, just put them all together inside one single image file and use CSS to specify the area of each image. This solution also applies to SVGs. Convert images to WebP. WebP is a new image format that provides lossless and lossy compression for images on the web. WebP lossless images are 26% smaller in size compared to PNGs. But WebP browser support is low compared to PNG, GIF and JPEG. Inline CSS. If your CSS files are small, just inline them in your HTML using the <style> tag. That will save you some server requests and will help avoid page-render-blocking CSS. 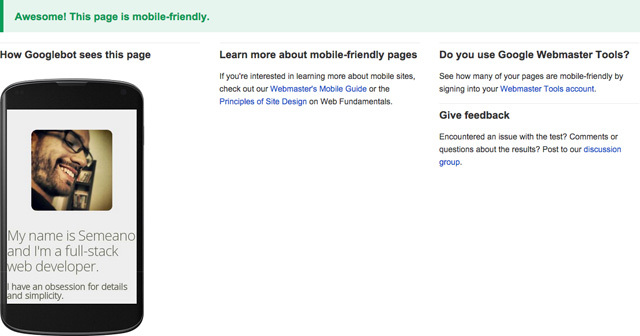 This is a practice Google PageSpeed Insights recommends. In future guides, I’ll share more intermediate-to-advanced website performance optimization tips and strategies, such as making changes to the structure of our HTML markup, other solutions for optimizing content delivery, and even some server configurations that will give us that final speed boost! Feel free to share this guide on Twitter and Facebook if this was helpful to you. Also, if you have ideas and tips for improving website speed, please share them in the comments. Pedro Semeano is a freelance full-stack web developer based in Portugal. Connect with him on his site, semeano.me, as well as on Twitter and Github.